(Phys.org)—Though scientists have long believed that complex organic molecules couldn't survive fossilization, some 350-million-year-old remains of aquatic sea creatures uncovered in Ohio, Indiana, and Iowa have challenged that assumption. 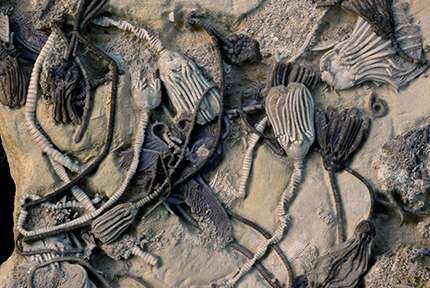 The spindly animals with feathery arms—called crinoids, but better known today by the plant-like name "sea lily"—appear to have been buried alive in storms during the Carboniferous Period, when North America was covered with vast inland seas. Buried quickly and isolated from the water above by layers of fine-grained sediment, their porous skeletons gradually filled with minerals, but some of the pores containing organic molecules were sealed intact. That's the conclusion of Ohio State University geologists, who extracted the molecules directly from individual crinoid fossils in the laboratory, and determined that different species of crinoid contained different molecules. The results will appear in the March issue of the journal Geology. "There are lots of fragmented biological molecules—we call them biomarkers—scattered in the rock everywhere. They're the remains of ancient plant and animal life, all broken up and mixed together," he said. "But this is the oldest example where anyone has found biomarkers inside a particular complete fossil. We can say with confidence that these organic molecules came from the individual animals whose remains we tested." Lead author Christina O'Malley, who completed this work to earn her doctoral degree, first began the study when she noticed something strange about some crinoids that had perished side by side and become preserved in the same piece of rock: the different species were preserved in different colors. "People noticed the color differences 100 years ago, but no one ever investigated it," O'Malley said. "The analytical tools were not available to do this kind of work as they are today." O'Malley isolated the molecules by grinding up small bits of fossil and dissolving them into a solution. Then she injected a tiny sample of the solution into a machine called a gas chromatograph mass spectrometer. The machine vaporized the solution so that a magnet could separate individual molecules based on electric charge and mass. Computer software identified the molecules as similar to quinones. Though different colored fossils contained different quinones, the researchers cautioned that there's no way to tell whether the quinones functioned as pigments, or that the preserved colors as they appear today were similar to the colors that the crinoids had in life. "We think that rock fills in the skeleton according to how the crystals are oriented. So it's possible to find large crystals filled in such a way that they have organic matter still trapped inside," Ausich said. The location of the fossils was also key to their preservation. In the flat American Midwest, the rocks weren't pushed up into mountain chains or heated by volcanism, so from the Ohio State geologists' perspective, they are pristine. "These molecules are not DNA, and they'll never be as good as DNA as a means to define evolutionary relationships, but they could still be useful," Ausich said. "We suspect that there's some kind of biological signal there—we just need to figure out how specific it is before we can use it as a means to track different species."